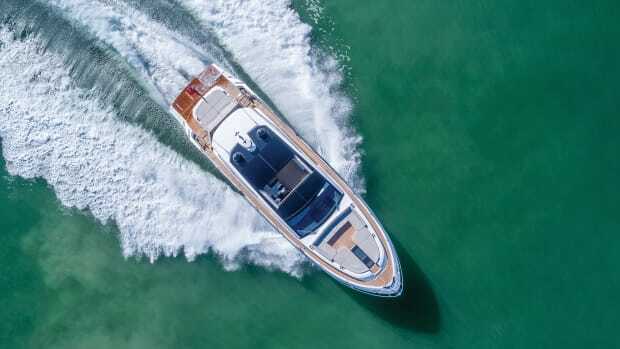 It takes a certain level of confidence for a boatbuilder to lend a yacht to a magazine staff for a summer-long review: confidence the boat will be returned in the same condition it was received; and that in all that time we won’t find any quirks or issues, that could potentially lead to a disparaging report. 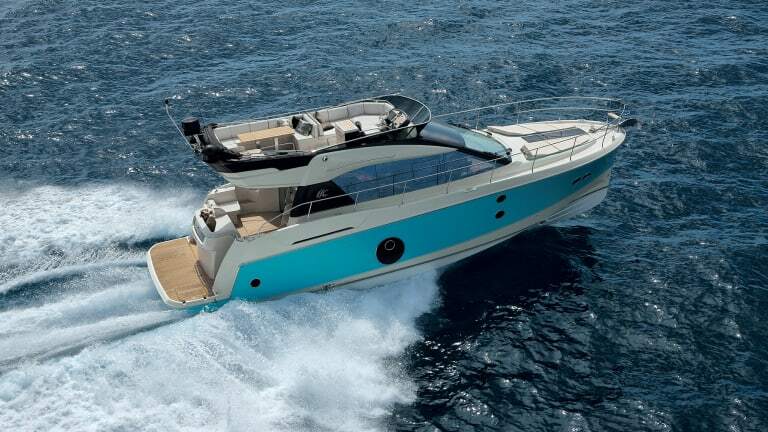 French boatbuilder Beneteau Group had a pretty good basis for believing the MC5 was a proven performer. 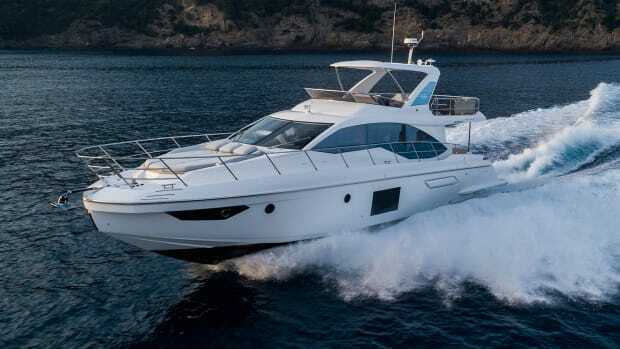 With 83 boats sold it had plenty of positive customer feedback to hang its hat on before deciding to let Power & Motoryachttake hold of the throttle. 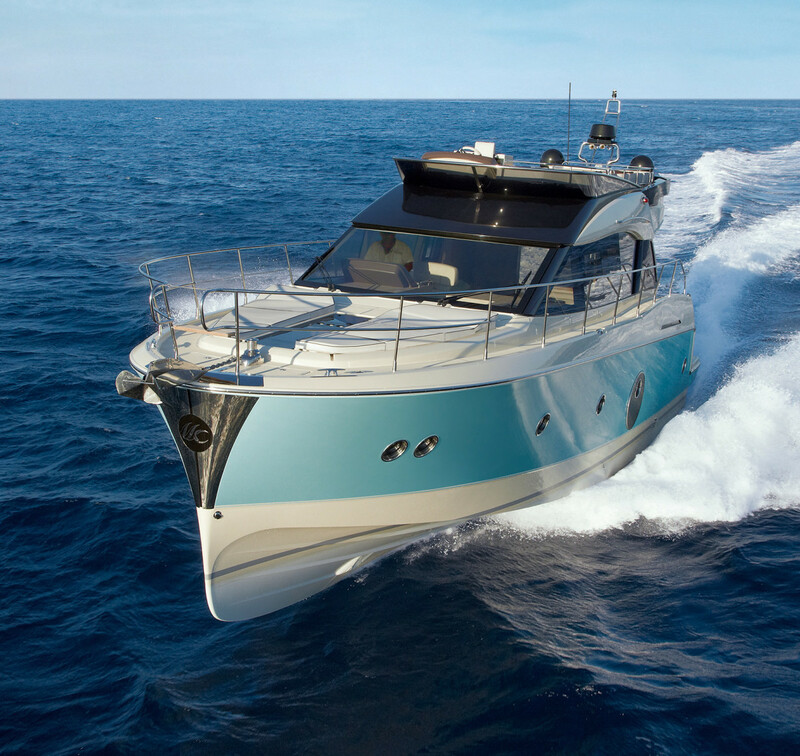 When we took possession of the MC5 from Castaways Yacht Club in New Rochelle, New York, it was boat-show ready in every way. You could see your reflection in the stainless and windows (there are a lot of both). Stepping into the salon for the first time felt akin to stepping into a floating museum. I didn’t want to touch or bump into anything. Heck, I didn’t even want to raise my voice or radio volume too loud—it was someone else’s boat after all. That feeling would eventually subside, as we got intimately familiar with the boat, her accommodations, and performance. 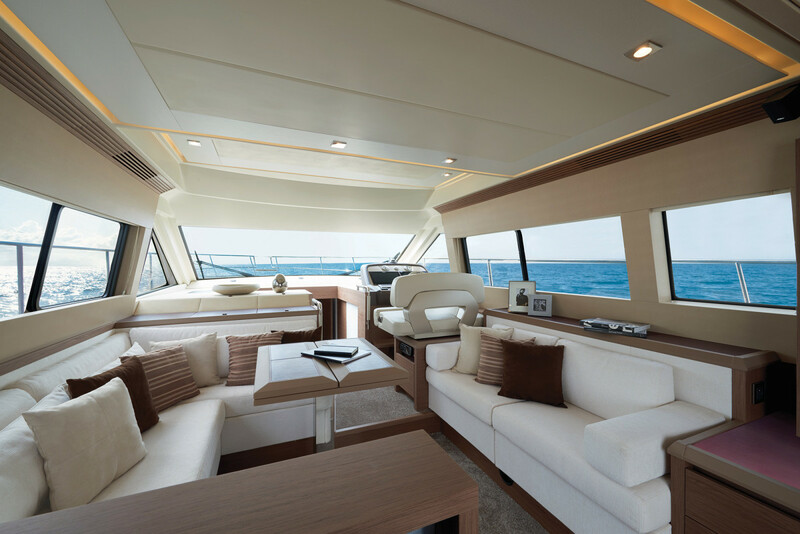 Having had the unique opportunity to see the flybridge before any of the furniture or even the helm was installed, I could fully appreciate the expansive space here. After the huge C-shaped settee, the lounges, and sunpads were installed, the space somehow felt even bigger. I hypothesized that the team would spend a lot of time up here. And we did. We easily sat around the table for morning meetings and evening dinners alike. This space was also where most of the driving took place. It was nice that up to four people could sit and chat comfortably with the helmsman on longer cruises. Sightlines are sound all the way around the boat, and it’s pretty easy to see the aft starboard corner by looking down the stairs. You can’t see the aft port corner, so you’ll need a trustworthy crew member there to help direct you when backing into a tight slip. Or, better yet, when you have the boat lined up you can hand the control down to the starboard wing station. 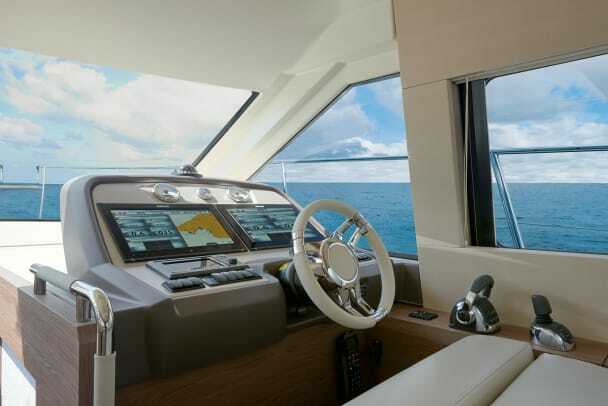 Our MC5 didn’t have the Volvo Penta DPS system ($26,000) installed, and I wouldn’t say we needed it, but it would have been nice for singlehanded docking. Don’t be surprised if you find family members—or coworkers—enjoying the comfort of the salon’s U-shaped sofa to port and starboard settee. 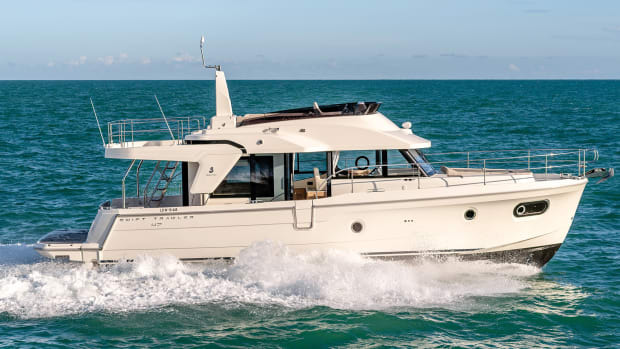 The flybridge can be equipped with a grill, fridge, and sink behind the helm. We learned the hard way that the cold stowage aft is a freezer. (“Who put sodas in here? They exploded everywhere!”) Our boat didn’t have the flybridge grill and to be honest it wasn’t an option I would spring for. If the weather allows for a cookout, the swim platform grill is where I’d want to be. 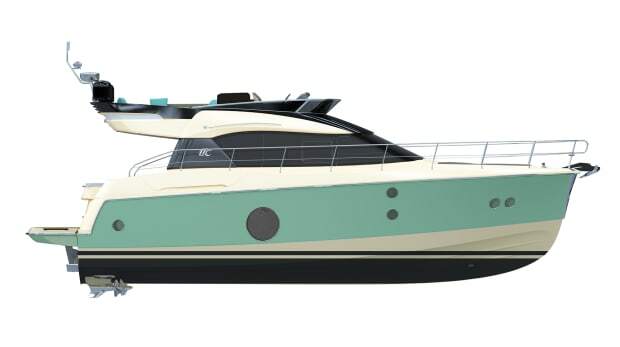 The cockpit easily accommodates eight adults and, thanks to fully opening salon doors, integrates well with the rest of the boat. The one thing we thought was strange at first was the deep cockpit seating. 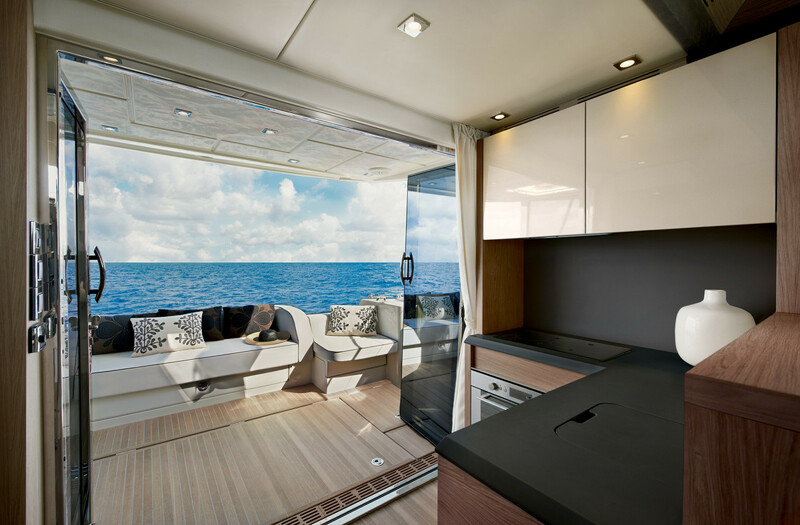 You feel as if you’re reclining back on it, which is great when doing most of the things you do on a boat, like taking a nap or reading a book. But when you’re leaning back and talking with a coworker it feels odd. We got used to it quickly enough. The cockpit lounge conceals a huge locker. For our purposes, one of the most useful features aboard was the stowage under the aft cockpit seating. The space was cavernous and featured stand-up headroom. In this locker we were able to stow all the gear: everyone’s bags; cases of, umm, water; food, and every other odd and end you need on an extended cruise. It was a godsend. The one thing I might add here is some sort of shelving in certain places so you don’t need to stack everything. 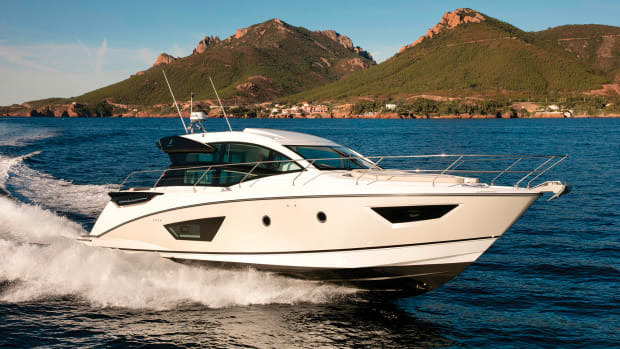 In most aspects, the MC5 is a spacious and luxurious yacht. Then the time finally comes when the night ends and the crew is ready to go to sleep. This is when most boats have a funny way of shrinking, especially if you’re staying aboard with coworkers. Thankfully for us, the MC5 was up to the job. The full-beam master is exceptionally comfortable. There’s plenty of room to walk around and the side lounges proved to be a great place to escape to for a conference call without losing your connection to the water. The en suite VIP forward was another coveted spot on board. To starboard is a guest stateroom with a pair of bunks. Things were tighter here, but the fact that both bunks have opening ports made this space feel much less claustrophobic. Now if we could only settle who gets the top bunk in a civilized manner. The salon sports two sleeping spots. The U-shaped sofa to port, I can attest, was very comfortable for one person. If a hi-lo table was put in here it would be more than comfortable for two people (not recommended for coworkers). 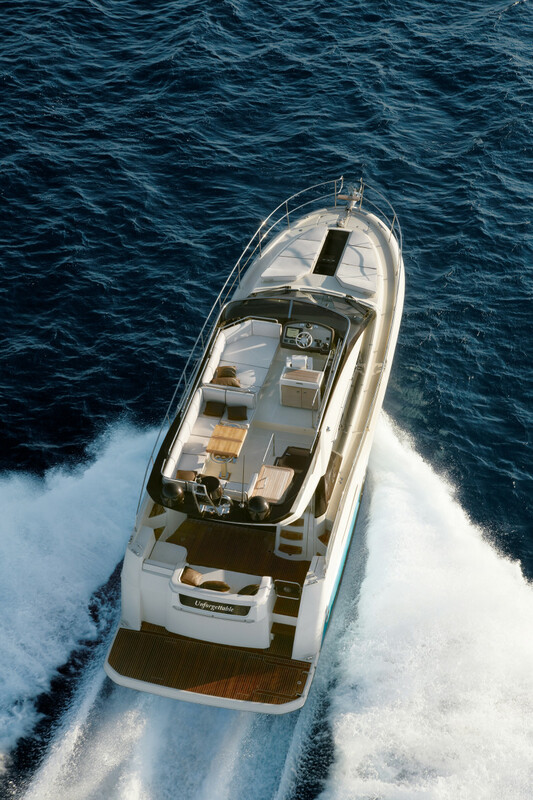 There’s also a small settee to starboard that can be used in a pinch for a night—maybe two. The head in the master stateroom was the nicest on board with a good-size stall shower with a glass door. The second head, with a door from the VIP and dayhead access from the passageway, was a little more cramped, especially when it was time to shower. I have mixed feelings about the growing-in-popularity shower tube. It keeps the rest of the head dry, but I’m fairly trim, and I felt I was standing inside a test tube. It might have been better to just make this space a wet head. 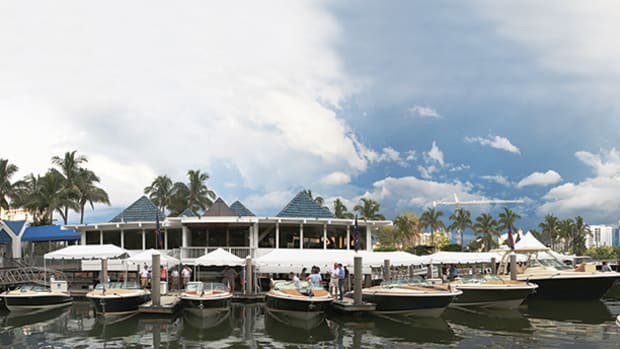 When someone signs over a $1.1 million dollar boat to your company, even with insurance, you can (read: should) feel some pressure, especially when docking in a new marina. This is when the Volvo Penta joystick puts its arm around you and says, “Don’t worry, Dan. We got this.” OK, maybe that was a hallucination conjured by my subconscious to help me. We encountered slips as tight as a snare drum and others surrounded by superyachts. There were low bridges and a lock in the Shinnecock Canal that haunts me to this day. The truth is, the MC5 is highly maneuverable, and with enough practice we could park this boat just about anywhere. On the performance side, she seemed most comfortable cruising between 17 and 20 knots. She tracked extremely well in a head sea and a little less so in a following sea, as expected. She handled a stacked 3- to 4-foot chop really well head on, again less so in a beam sea, but I never felt uncomfortable, let alone unsafe, in any sea condition we encountered. Time, as it always seems to do, flew by that summer. And all too soon we were returning the keys and raising a glass to memories—and a boat—come and gone. A few of us saw “our” MC5 again at the Newport boat show a few weeks later. 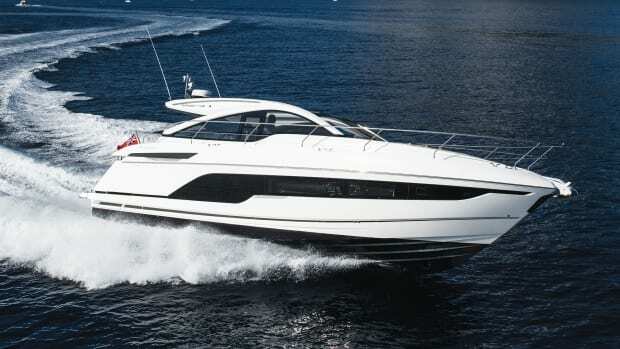 She was freshly waxed and polished, a standout even by boat-show standards. 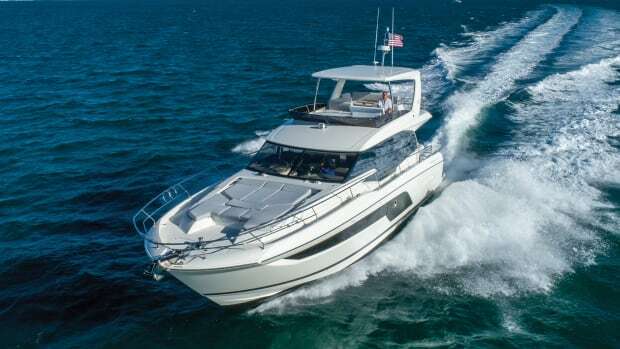 It made me think about how timid we were to use her at the beginning of summer and how by the end it had become a summer home, complete with cannonballs from the flybridge, afternoons on the Connecticut River, and a host of countless other memories. 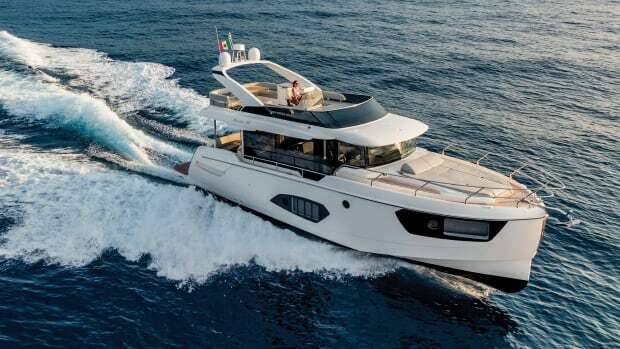 It’s a proper yacht to many eyes, but when you peel back its layers, it ends up being a perfect platform for memories made out on the water. TEST CONDITIONS: Air temperature: 80°F; seas: 1-2&apos;; wind: 5-10 knots. LOAD: 100 gal. fuel, 20 gal. water, 4 crew. 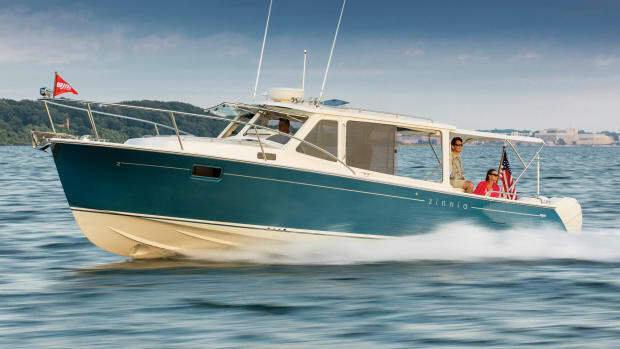 Speeds are two-way averages measured w/ Simrad GPS. GPH taken via Volvo Penta display. Range is 90% of advertised fuel capacity. Sound levels measured at the lower helm. 65 dB(A) is the level of normal conversation.